In the red corner, we have Katy Perry who's trying hard (maybe a little too hard) to recreate the viral success of her TGIF video. Her latest promo, for the PRISM track Birthday. In a "hilarious" series of Candid Camera stunts, she poses as hopeless entertainers who ruin other people's birthday parties. I'm sure it's all a great joke, but some of the children look traumatised. Meanwhile, in the blue corner, tUnE-yArDs (aka Merrill Garbus) has gone for the surreal option. Her song Water Fountain has the clack-clack rhythm and nursery rhyme melody of a modern-dayIko Iko and, appropriately enough, the video is styled like a kids' TV show - complete with singing sofa and dancing finger puppets. Again, your children will be traumatised. 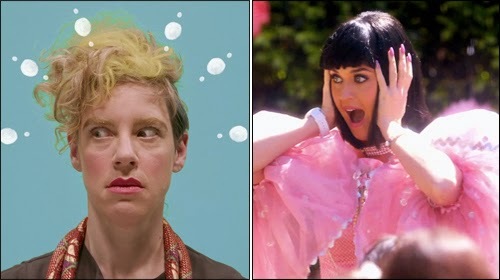 On balance, I think Katy wins the Gif war, on the basis of this image alone. But tUnE-yArDs gets special merit for the "bonus content" science lesson she's uploaded to YouTube. How many straws can you cram into a potato?